It’s no secret that I’m a huge fan of Nausicaä of the Valley of the Wind– I’m a big fan of the movie, and the manga is my all-time favorite piece of science fiction. For a bit of background, Hayao Miyazaki, author of the manga and director of its film adaptation, began work on the manga in 1982 after he tried (and failed) to create a film adaptation of Richard Corben’s Rowlf. Originally serialized in the magazine Animage, Miyazaki wasn’t initially planning to have the manga adapted for film, but the manga proved successful and the talent behind the film adaptation eventually led to the formation of the legendary Studio Ghibli, the animation house responsible for some of the greatest movies of all time. The video embedded below perfectly encapsulates why Miyazaki’s films have captivated and inspired millions, it’s well worth a watch. If you’d like to watch Miyazaki’s films, a great collection is now available on Amazon if you’re looking to jump right in– today, however, will not be so much a celebration of Mr. Miyazaki’s filmography; rather, it’s the first of many examinations of his manga masterpiece, Nausicaä of the Valley of the Wind. Seeing as it’s the end of #RRSciFiMonth, it’s the perfect time to debut this ongoing series, Nausicaä 100 Pages at a Time. I’ll be examining the story, themes, characters and other elements of the manga one hundred pages at a time. Mind you, many wonderful stories have influenced Miyazaki’s Nausicaä of the Valley of the Wind including Tolkien’s Lord of the Rings, Homer’s Odyssey and The Lady Who Loved Insects (also known as The Princess Who Loved Insects) from a 12th century collection of stories from Heian era Japan. While I’ll try to tie in the influences as best I can, I may have to produce a second edition of these essays at some point in the future with more examination of the influences. For now, however, it’s time to examine the first hundred pages of Nausicaä. I’m going to say it now- everything’s going to be spoiled. If you don’t own the manga, I recommend you buy it and read along with me. If you’ve read it before but don’t remember very much, I’ll provide a synopsis- if you’re reading along, you can skip reading my synopsis and jump down to the Examination section. Synopsis: The manga opens with an explanation of what occurred long ago- that industrial civilization had peaked and abruptly fallen by fire, but in spite of it, mankind lived on- but the “sophisticated technological superstructure” had been lost- a fantastic way of prefacing that this is a piece of postapocalyptic fiction; a bit more exposition reveals that the world has been horribly polluted, toxic bacteria have a foothold in the forests and that the little kingdom of five hundred- the Valley of the Wind- is largely spared from the world’s poisons by a stiff ocean breeze. The titular protagonist, Nausicaä, is introduced as she’s exploring the toxic jungle- having discovered a freshly molted ohmu shell, she recognizes its value and, for a while, relaxes upon it- the peace of the moment is broken by the distressed cries of giant insects, whose voices only our protagonist can hear. She discovers that a whole swarm of them- including a massive, raging ohmu- is pursuing somebody. Using harmless strobe grenades, she pacifies the insects and sends them back to the forest. It’s soon revealed that the person in trouble was her beloved teacher, Master Yupa Miralda, expert swordsman and adventurer, that the Valley of the Wind is on the brink of war, and that Nausicaä’s father, King Jhil, is too sick to fight due to poisoning from the toxic jungle. It’s later revealed that Nausicaä had ten siblings who didn’t survive childhood, and that King Jhil regrets not having a son as an heir- but also that he believes that Nausicaä would make a fine chieftain. Nausicaä then goes on a trip with her uncle Mito in the gunship- it’s revealed that this flying vessel was built over a hundred years ago, and that nobody has the technology- or knowledge- to build them anew. Nausicaä once again hears the cries of distressed insects in her mind and finds that they’re attacking a flying barge- and to her horror, she discovers that a refugee ship it’s filled with women and children. In spite of her best efforts to stave off the insects, the ship crashed, killing everybody on board. Running into the wreckage, Nausicaä discovers Rastel (named Lastelle in the English dub of the film adaptation), a dying princess of Pejitei, who reveals that their allies from Torumekia were the ones who attacked. Before she dies, she gives Nausicaä what appears to be some sort of royal bauble meant to be given to her brother. The Torumekians eventually arrive at the crash site, and upon discovering that Rastel had been given a burial by somebody from the Valley of the Wind, the Torumekians head there- disregarding proper procedure on landing and nearly inciting a war. The sluglike creatures owned by the worm handlers smell the royal plot device on Nausicaä- what ensues is a brief duel between her and the Torumekian soldiers that is broken up by Master Yupa, who reminds everybody of the fragility of the alliance between the Valley of the Wind and Torumekia, thus convincing the Torumekians to retreat. It’s then revealed that the Torumekian forces are in possession of a god warrior, but they’re short a control stone- the royal bauble that’s kept in the Valley of the Wind- meanwhile in the valley, Yupa discovers that Nausicaä has been growing the supposedly poisonous plants and fungi from the jungle in secret, and that, given clean water, they don’t produce toxins. Afterwards, Nausicaä departed to join a fleet of airships from the surrounding tiny nations in battle- some time after joining up with the fleet, a rogue gunship attacks its barges- it’s Rastel’s brother, who shoots and quite badly damages the Torumekian barge carrying Kushana, the general who led the foolhardy excursion to the Valley of the wind- her assistant takes the helm of the ship, and with that, we’re one hundred pages into Nausicaä of the Valley of the Wind. The first thing worth talking about in any discussion of Nausicaä is how the characters are handled. The first hundred pages have not only been a great introduction to the world, cultures and conflicts but most importantly, the characters of Nausicaä including the titular princess. The way that Nausicaä herself is introduced to the story is relevant to all the other aspects of the story; the story opens with Nausicaä on her iconic white glider on an expedition into the jungle. Within the space of ten pages, her inner dialogue and actions reveal her character’s love of nature, offer clues into the sort of world she inhabits and the cultures that she’s part of. Her scavenging of a shed ohmu shell is a window into her dependence on the natural world; she is a character who is so in touch with nature and the environment around her that she as good as is as a part of it. 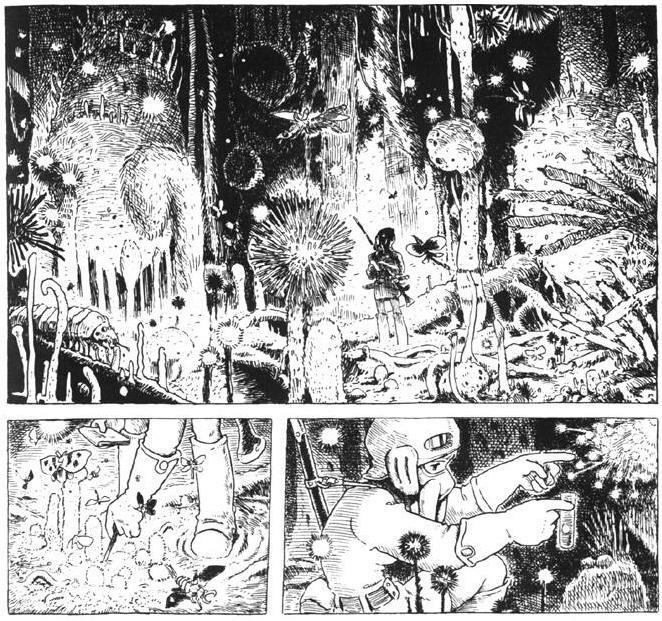 Nausicaä is an environmentalist, the very embodiment of her creator’s ideals- without her, the story in this manga would still be interesting, but the setting would be little more than a postapocalyptic backdrop- the themes in the story, such as the importance of caring for the environment and the value inherent in living in harmony with the natural world would not have shone through if not for the character of Nausicaä. Being an environmentalist entails more than just an appreciation of the environment, however- Nausicaä is quite clearly a scientist, as evidenced by her experiments with the plants from the toxic jungle. Though she is a part of the world around her, she isn’t so arrogant as to believe that she has no more to learn about it. Nausicaä’s the star of the story, but she’s not the only fascinating character- Kushana, daughter of the Vai emperor and rival to the protagonist is, to Nausicaä, a proper foil- where Nausicaä is a nature loving pacifist concerned with the well-being of others, Kushana is a warrior would sooner see the jungle destroyed. That’s not to say she’s a villain; something I appreciate about many of Miyazaki’s works is that they tend not to have characters who are pure evil, and Kushana is no exception. Even though she has qualities that make her seem initially repugnant as a character, she turns out to be one of the most fascinating and relatable characters in the manga on account of her having empathy, concerns, worries- she’s a fantastically fleshed out character. Initially, however, Kushana is incredibly antagonistic. From the way that she lands in the Valley of the Wind as though she’s invading to the way that she destroys Nausicaä’s sword, she’s set up in opposition to the protagonist, both politically and ideologically. Master Yupa’s role in the story is that of a loving mentor to the protagonist; he’s an important supporting character who doesn’t help the protagonist find herself so much as a character who’s there to remind Nausicaä of who she is and of the importance of remaining true to herself. Take, for example, the scene in which Nausicaä is fighting Kushana’s men and Yupa dashes right into the conflict, being stabbed in the arm by his pupil, who comes to realize that she’s been infuriated to the point of violence, which has only led to harm. Where Kushana serves as Nausicaä’s foil, Yupa is a mirror into her heart. A discerning reader may note that a fair amount of exposition occurs within these hundred pages- and yet, I hold it up as a prime example of good storytelling. Why? Because even though it’s clear that the characters are speaking about aspects of the world for the benefit of the audience, it doesn’t come across as exposition- it all makes sense as conversation for the characters. There’s more to the characters that will be explored in future instalments of Nausicaä 100 Pages At a Time, for the time being, I invite your commentary; what do you think of my examination thus far? Mind you, this is essentially the “pilot” essay- I have much more to say about Nausicaä’s themes, characters, world, style and worldbuilding- I’d love to talk about how Nausicaä is a strong female character who doesn’t go galavanting boldly about proclaiming that she’s a strong female character (something that certain more recent works could stand to benefit from), and I can’t wait to talk about how environmentalism and the ethics of biological warfare are themes that stay out the forefront of Nausicaä that remain accessible without being shoved down the throats of readers but before I advance, I’d like some feedback on what I can improve in my own writing, and what you’d like to see out of my examinations. Please leave me your feedback below or hit me up on Twitter @Jourdan_Cameron. By the way, it might not be immediately obvious, but one of the works that inspired Nausicaä is Asimov’s Nightfall, which you can listen to for free over here. It’ll be clearer later in the story how Asimov’s apocalyptic tale of darkness influenced Miyazaki’s environmentally oriented epic. What Shall I Write Next? It might be of interest to divulge in comparing the Manga with the film it’s based on. It seems like you’re still relatively early in the story. The antagonists aren’t so transparent; especially as you get into the latter parts of the story. But I won’t spoil it for you. Enjoy! I’ve read the manga in its entirety and absolutely love how the “villains” unfold (especially the emperor! ), I do think that doing a film/manga comparison might make for a good entry; I just might go for that before continuing this essay series. Thank you for your feedback! Care to join me in developing a petition to get Hayao Miyazaki to one day develop the full Manga into an animated series? I know he’s mentioned continuing to work on some form of anime/manga during his “retirement” from Studio Ghibli. I love what you’re doing here, do you have a Part II? Not yet! I’ve been procrastinating on it a bit; it probably won’t happen this month because I have a LOT going on, but I might do it in May- as I mentioned in another comment, I’ll be doing a piece comparing the manga to the film. Keep an eye out for it! You might want to follow me on Twitter since I’ll be posting it there as soon as it’s up.